Recently, demonstrators have been showing up in various public places, including coffee shops and fast food restaurants, openly toting a variety of tactical long guns. Unlicensed open carry of handguns is legal in about half the U.S. states, and it is relatively common and uncontroversial in some places. Yet while unlicensed open carry of long guns is also typically legal in most places, it is a rare sight to see someone sidle up next to you in line for lunch with a 7.62 rifle slung across his chest, much less a whole gaggle of folks descending on the same public venue with similar arms. Let’s not mince words, not only is it rare, it’s downright weird and certainly not a practical way to go normally about your business while being prepared to defend yourself. To those who are not acquainted with the dubious practice of using public displays of firearms as a means to draw attention to oneself or one’s cause, it can be downright scary. It makes folks who might normally be perfectly open-minded about firearms feel uncomfortable and question the motives of pro-gun advocates. I agree with this piece, and the rest of the article 100%. OC of handguns is a relatively normal and benign thing. When I see a dude OC’ing, I usually don’t even give it two thoughts, because a dude with a pistol is just a dude. However, a dude wandering around with a loaded rifle is unusual, and like ILA says, a little weird. I’m glad to see that NRA has officially weighed in here; and I hope that the few OC hacktivists causing all these problems understand the rebuke inherent in NRA’s article. Get ready for the fun in the comments. These OC losers need to knock it off. The photo above is full of Derp. Don’t do like the photo above. You might be unaware of the issues surrounding open carry in Texas, and the reasons people are taking to establishments, open to the public, with long guns. The harassment and arrest of many law abiding citizens, often in rural areas, walking the streets with their long guns safely slug over there backs, has been an issue here. Though I would not advocate a group walking into Starbucks with AR-style rifles hanging, I would advocate taking the same approach into the public streets. The people that go into businesses with a camera, only looking to get Youtube hits, are not taking the right approach (in my humble opinion). A large crowd walking the streets of Houston would certainly be more effective. The fact is that we are allowed by law to carry our firearms (long guns) on our person in the great state of Texas, and that this legal act is often used by law enforcement as “cause” to stop and harass us; and often to confiscate our legally owned and possessed firearms. We need to bring more attention to the rights we still possess here in this wonderful state, before they are taken from us in the dark of night. I think we could all agree that a little more common sense, and a little less attention seeking is in order. But, to demonize these guys for doing what they have a legal right to do is simply wrong. I could understand if they gave the business owners trouble when asked to leave, but I have seen nothing showing them to be resistant or impolite. I am a constitutional carry man at heart, and believe the government has no authority to limit in any way the right of the people to possess and carry upon their person firearms and ammunition. But hey, I use a dictionary and reference materials when I read my copy of The Constitution. Do you think that position is crazy? Think it will lead to many more gun deaths? Well, when you think of gun violence, how often do you think of Vermont? Well, Constitutional Carry is adapted from the term Vermont Carry. They have been doing it since 1777 and Vermont doesn’t stand out to me as a place of violence. Vermont doesn’t stand out as a place of violence, but Texas does. Look at our neighbor to the south, a third world country run by drug dealers, Yet you compare as if they were the same place? Any kind of open carry is attention seeking. What happened to the element of surprise? take a look at this site:http://www.narcopress.com/ ..its idiots like this that will grab your gun when you are shopping for your new open carry flag, what happens next depends on their level of stupidity. I am NRA, Second Amendment Foundation, and a CFP holder and I DO carry. I absolutely support both concealed carry and open carry, (I choose Concealed Carry). 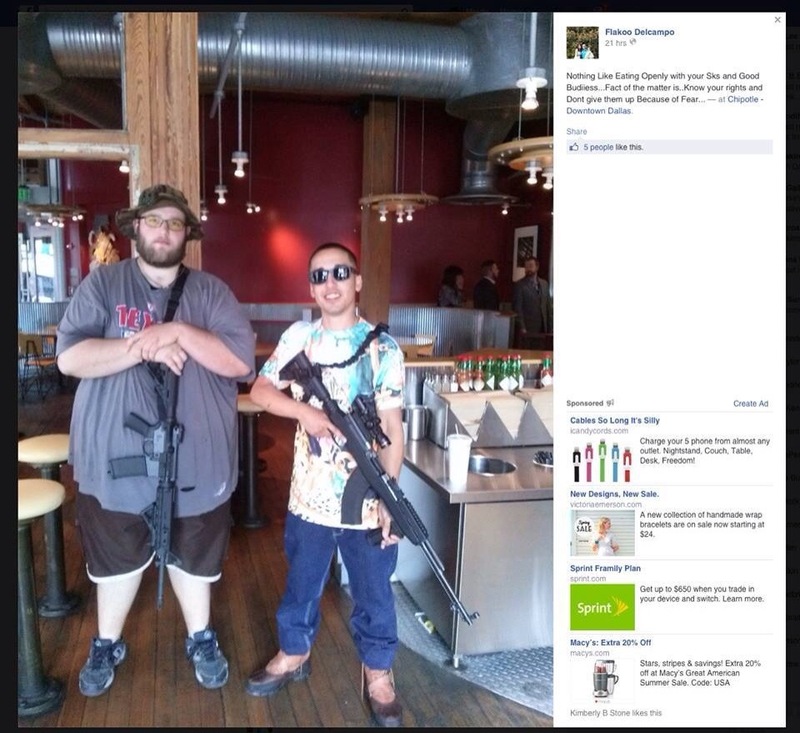 I get the commitment and zeal of the Texas Open Carry group. But I will side with the NRA on this. People understandably become apprehensive at the sight of heavy firepower in an otherwise unremarkable setting. As they should be. I as a concealed carry person would be very “Alert” to a presentation such as that until I was able to determine that it was not threatening. Which I quickly would, BECAUSE I am very familiar with guns and what a threat would look like. TONS of other people would not get it, and would try to be cool about it while being quite unsettled. The tactic is getting doors closed to a great many of us who are working towards most of the same goals, and for right now, it’s overboard. Now a large public gathering that does not involve a private business, but rather a public place………. AND, I have read theories about the group actually being a gun prohibitionist group using the tactic to generate bad press for our side. Not too hard to think that. The big difference, as Tam pointed out is that when people are OC’ing rifles in Switzerland, it’s normal because it’s a government sanctioned and even required activity. The Swiss being who they are, if they see someone with a slung rifle, they would assume they’re on their way to or from a government sanctioned shooting activity. Here in the States, for all our freedom, the government doesn’t really mandate shooting, so seeing someone on the streets with a service type long gun is unusual. For all the people that stood by the NRA, do you now stand by them as they support the open carriers? They have said that it was a single employee’s opinion and does not represent the NRA’s views. Everyone is entitled to their opinion…but opinions change no facts of law or reality. Have a great day fellow friends of firearms. If you parse Chirs Cox’s words carefully, all tehy walked back was calling OCT’s antics “weird”. Hell, even in the ORIGINAL post, they repeatedly defended Open Carry — what they attacked was the tactic of Open Carrying rifles in businesses TO GET ATTENTION. All you rifle owners need to stay in the back of the bus. The law is open carry of rifles in Texas is legal. I see no problem with legal behavior. More people should tote rifles, not less. It seems that too many people think the right to keep and bear arms only applies when it’s the type of arms they prefer.